We have been talking about how quickly beacon hardware and the beacon ecosystem have evolved in the span of less than a year. The latest development in this space is the entry of a new type of beacon that aims to do away with a lot of hassle involved in beacon deployments. Enter Virtual Beacon, the AC–powered multi-frequency beacon that offers bluetooth connectivity and radio waves transmission. Virtual beacon technology is offered by a company called SmartFocus and they claim this technology can be a powerful alternative to battery-powered beacons. How do Virtual beacons work? An AC-powered, multi-frequency beacon from any manufacturer, is required to be placed at the entrance of the store. The store owner inputs the store’s floor plan into the system. He/she can then draw zones on the same floor plan to define areas where marketing messages need to be sent to customers. Geo-targeted store sections can quickly be redefined by redrawing boundaries on the floor plan in the software. This contrasts with the standard beacon deployments, where you need to physically move a beacon to the shoes aisle if you want to separately define it as a geo-targeted area. As with normal beaconing, the customer needs to have the retailer’s app installed on his/ her phone, and must have used it at some point to opt in so the system can gain access to his/her magnetometer. The app need not be open in the foreground while the customer is in store. These virtual beacons use the magnetometer in the customer’s phone, which acts as a compass, and triangulates the customer’s position using Wi-Fi and radio frequencies. Another important feature is that if Wi-Fi is unavailable or the magnetometer is not accessible, the system’s geo-targeting will still work to some degree, but with a reduced resolution. What differentiates Virtual beacons from the standard ones? 1. One beacon per store: Contrary to standard beacons, that need to be placed around any space where a retailer/brand aims to send beacon-enabled notifications to its customers, virtual beacons require an AC-powered, multi-frequency beacon from any manufacturer, to be placed at the entrance of the store. Only one beacon is required, irrespective of the size of the store. 2. Radio frequency transmission: Virtual beacons emit Bluetooth as well as transmit radio frequencies. 3. Accurate positioning using magnetometer: Working in tandem with the magnetometer in the customer’s phone, the virtual beacon system can triangulate the customer’s position using radio frequencies and Wi-Fi. The phone’s magnetometer, in this case, acts as a compass. A standard beacon on the other hand, locates the current position of a customer by simply detecting the presence of an app in its range. 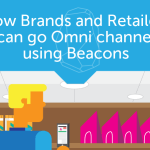 As more such innovations keep happening, beacons are sure to become the greatest tool in a retailer’s repertoire. Watch this space for more! 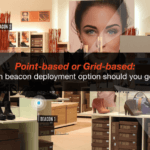 Point-based or Grid-based: Which beacon deployment will your business need?